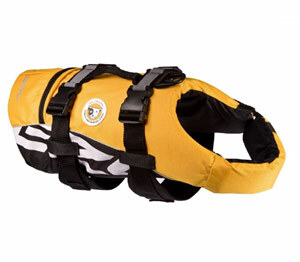 EzyDog dog life vest in highly visible yellow or red. A triumph of design and styling for dog life jackets, putting safety and functionality first. Combining advanced manufacturing techniques and the highest performance materials available, EzyDog have set the benchmark in dog life jacket design. 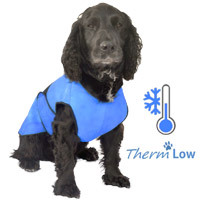 Designed and extensively tested to give your dog the most ergonomic and comfortable fit possible. Made to the same standards as human life jackets. 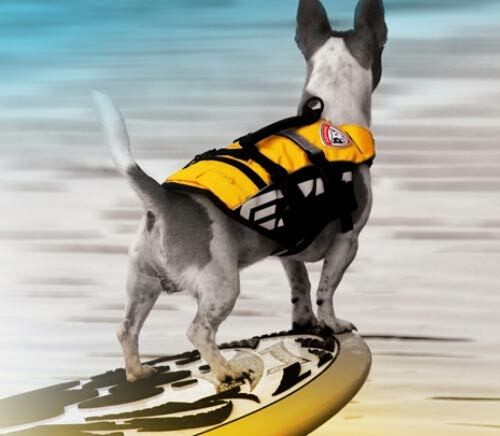 Unique ultra buoyancy foam is positioned within the vest to keep your dog in a natural swimming position at all times. 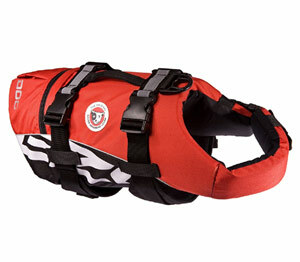 The dog life jacket features adjustable straps at the front and back. The neoprene straps encircling the chest and abdomen are double width for maximum comfort and the fabrics and strapping used are rot-proof in both salt and fresh water. Add to this a carry 'grab' handle, strong D-ring for lead attachment, high visibility piping, ultra heavy duty polyester, zip pocket and super soft neoprene lining for your dog's comfort, and you have the best available pet life jacket. Warm, comfortable and above all, a potential life saver. I bought this for my best friend Jada and it really is superb. The size is spot on and fits perfectly. The colour is bright and easy to spot when out on the water. As well as serving as a life jacket when on water it is also excellent for playing in the sea just in case! A really excellent product. A fantastic piece of doggie kit. It fits really well and gives my little rescue dog hours of fun in the sea. The jacket is an excellent fit and fully adjustable. Our GSD has worn it for a week boating on the Norfolk Broads and it does the job it's designed to do. Reflective panels work well at night and in the water. The handle is ideal to hook the dog out with. Excellent service from d for dog.